I’ve mentioned elsewhere on this site that Brewers fans love to attend games in groups. If you’re gathering a group and have the means (or a cool employer), you should look into the Miller Park party areas. These are all-inclusive spots with major sponsors that keep the party going even when the game starts, without having to worry about the tab you’re running. Dibs on the seats facing the field! Miller Park Party Areas, #1) The Northwestern Mutual Club. The Northwestern Mutual Club is the located down the left field line in the Club (third) Level. At the Club there is a fancy, carpeted, climate-controlled indoor dining area with décor celebrating team history, and several types of seating outside…from tables and chairs to seats at counters. These Club tickets include the daily varied premium buffet prepared by the Club chef, which includes a carving station and a gourmet salad station, along with the brats, nachos and popcorn. Two free drinks (beer or wine) are included, and there are bars on the inside and near the seating area outside. There is even an Alex’s Lemonade stand that distributes proceeds to children’s cancer research from lemonade sales. Like with the other group areas, it sounds expensive to get in, but it’s not bad at a per-person rate. The Club is pretty cool if you have the means, and the view from the seats isn’t half bad. No sharing chicken with patrons below please. 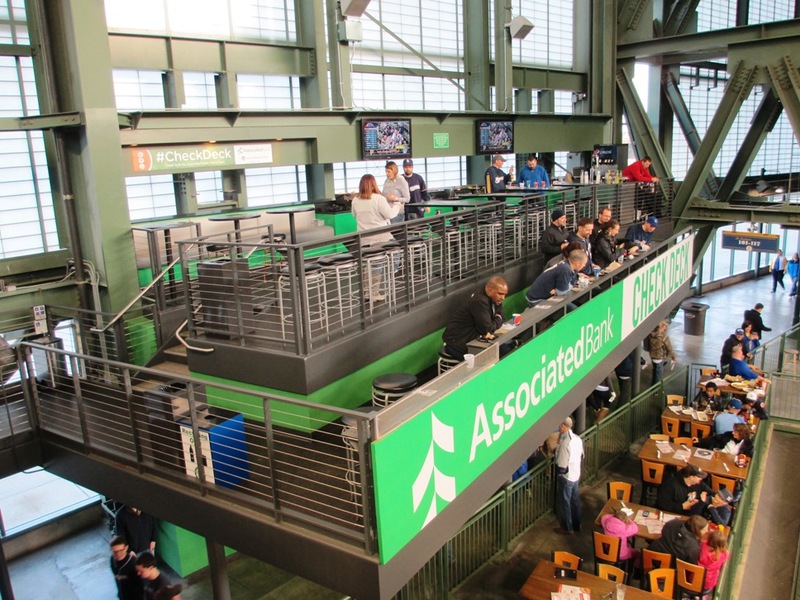 Miller Park Party Areas, #2) The Associated Bank Check Deck. The Associated Bank Deck is lower than most party areas, but pretty distant from home plate in left center field. This deck has barstools with tables, plenty of space to mingle with fellow bank customers, and general admission seating that overlooks the home team bullpen. It is very close to Bernie’s Slide, so you have that. 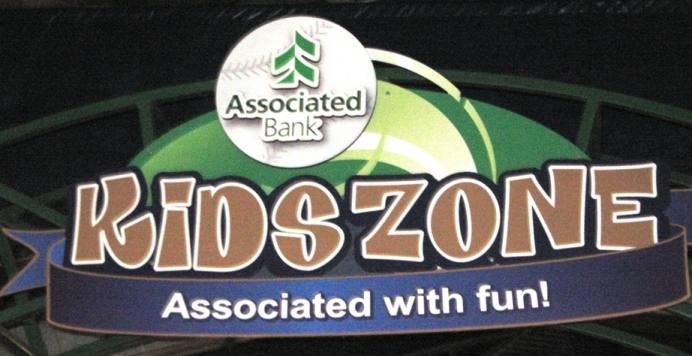 The Associated Bank Deck is mostly for groups, who get a decent deal on tickets. The game ticket includes a buffet (with similar items as the rest of the party areas, but with pulled pork and chicken breasts in case that matters to you) that goes until an hour after the first pitch and also includes two beers. There’s a private bar with TVs to watch the game. And that’s not all; there is a private entrance (adorned with the Bank’s logo and colors) that bank card holders can use regardless of where their seats are. It’s convenient to the east lots of the ballpark and is right there at the seating area when you enter. Watch for a batting practice home run in your nachos. Miller Park Party Areas, #3) The Aurora Health Care Bullpen. The Aurora Bullpen is on the field level behind the right field fence, next to the visiting team’s bullpen. The Patio is for groups, although individual tickets are sometimes sold. The area includes a full bar (outside! ), hi-def TVs, and enough tables and barstools and such to accommodate around 75 people. Your group gets a buffet that includes brats, dogs, BBQ chicken sandwiches, mac and cheese, a nacho bar, and two complimentary beers (Blue Moon!). Tickets go for around $100 a person for the moment, which with a buffet and two beers is a decent value. The view isn’t great through the fence, but it’s a neat place to hang out and feel like a relief pitcher. That’s three spots where fans gather courtesy of their employer or to celebrate some other occasion with a Brewers game. Lots of fun for all with their baseball. Stay tuned. If you’re a parent, you really should visit Miller Park with kids; it’s one of the most kid-friendly ballparks in baseball, and the Brewers do a lot to bring in young fans. Kids get to do all the cool stuff. The young one also gets a lanyard, a water bottle, a wallet to hold all that money he’s saving on tickets, and a poster, not to mention all of the exclusive stuff like be in a pregame parade, tour the ballpark, and get a picture with the racing sausages. Not a bad deal at all. It’s very popular, so get on it well before spring training starts. It gets much more crowded when the Sausages hang out. Miller Park With Kids, Tip #2) Three Play Areas. On the Field Level at Miller is the U.S. Cellular Power Playground, where kids can participate in a race to first base or a small scale Sausage Race, sit in a huge glove or mock-up dugout for a photo, or use the pitching and batting cage. It will definitely keep the little ones occupied for a while. 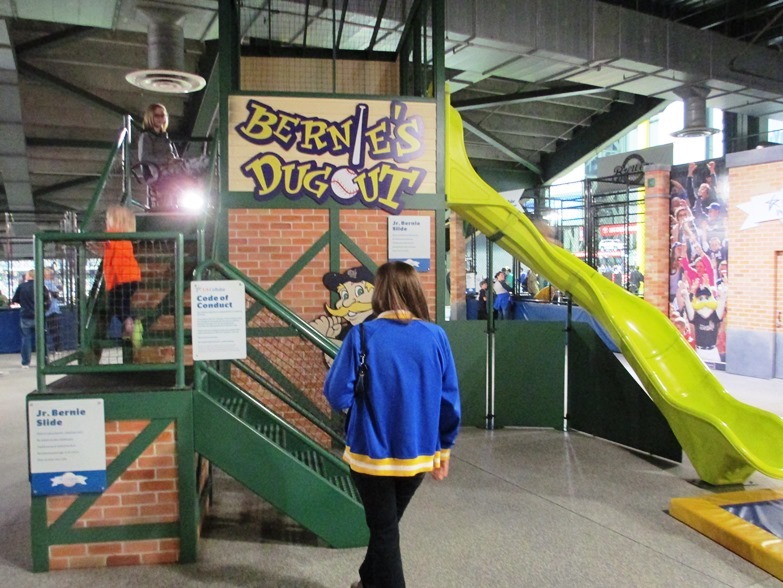 On the Terrace Level is Bernie Brewer’s Clubhouse, an equally fun play and concession area full of padded stuff for smaller kids. It’s a hike to get there, but if you’re using your Terrace seats from the club you’ll be on that level already. Outside of the ballpark there is a playground at Helfaer Field too, so the kids can burn off a bunch of energy while you’re waiting for the gates to open. With all of these places to play here, they might actually want to sit in their seats for the game afterward! Sometimes turning 17 isn’t all that great. Miller Park With Kids, Tip #3) Kid Promotions. 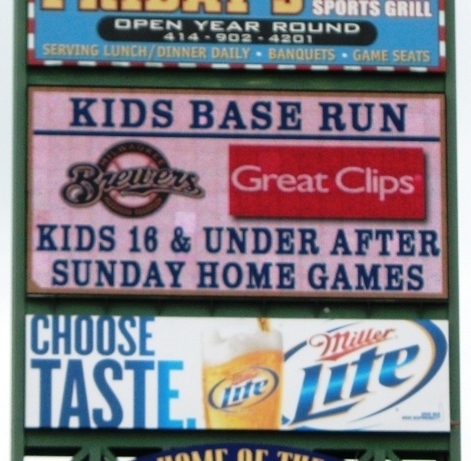 The Brewers also run frequent promotions for kids; they can run the bases on Sundays, get autographs from a Brewers player on certain dates, or have their birthday celebration at the game. If you want to run the bases, sitting on the first base side puts you closer to the line. There are contests to be an announcer for an inning, or pose on the field with a Brewer, listed on the Brewers website. These promotions are popular, so you should hop on them early. One last thing: when a Brewer hits a home run, poke the kid and tell him to look up to Bernie’s Terrace in upper left field, where Bernie will slide down into the lower terrace. Everyone loves it. The Brewers are more fan-friendly than most baseball teams, even when they’re in the hunt for a pennant. Here’s a few ways to score some cheap Brewers tickets. Notice that my first suggestion is to go through the team…I don’t say that often. 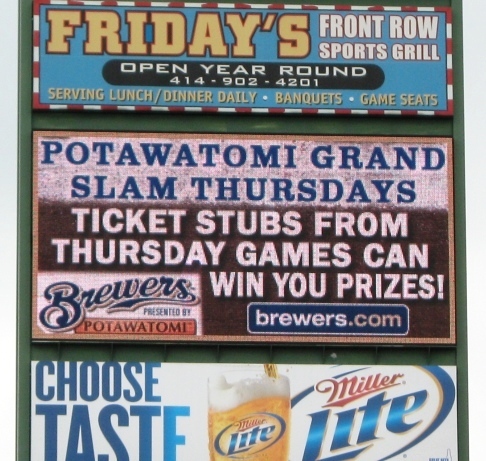 The Brewers have a lot of partner promotions too. Everyone loves them in this town. Cheap Brewers Tickets, Tip #1) Get The Team Newsletter. The Brewers offer a lot of specials in their e-mail promotions, even for a ballpark that already has a bunch of cheap seats. The Brewers offer discounted tickets for students, kids, seniors, first responders, and more, and they have quite a few discounted ticket days like their “5 County Fridays”. 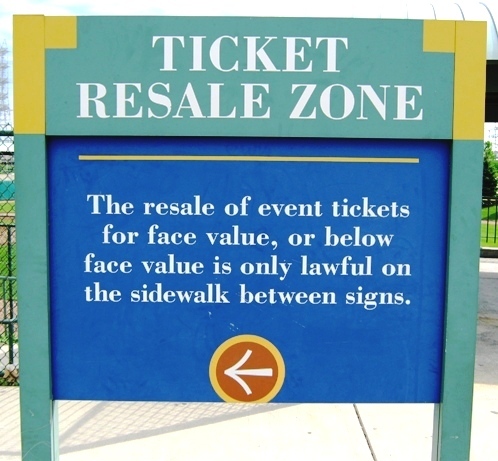 They often waive ticket fees for a short time, and that’s not a small chunk of savings. Their e-mail newsletter will remind you of these things, and many of them are popular and limited to availability, so jump on them quickly. Sign up here. You’ll thank me. Don’t worry if it’s a little cloudy. No rainouts, remember? Cheap Brewers Tickets, Tip #2: Be Flexible. If you’re not picky about which game to attend, click on the Dynamic Deals link in the ticketing section to see what the best ongoing offers are at that time. As you can see, it’s not difficult to persuade people to go to a Brewers game. Cheap Brewers Tickets, Tip #3: Bring Your Friends. 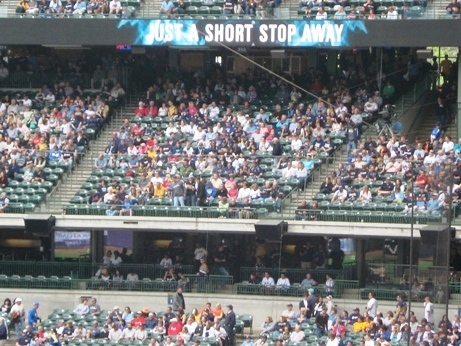 Milwaukee folks love to attend games in numbers, and the Brewers appreciate that. Groups can get tickets for crazy discounts on certain nights, and group leaders will receive a voucher for two free tickets in an e-mail with another couple if they can bring 100 folks. The larger the group, the bigger the discount, so summon all your game-selling skills to your co-workers (it shouldn’t be too hard in this town); the savings can be huge. They give you chances to win money during the game too. Cheap Brewers Tickets, Tip #4: Help Your Fellow Milwaukeean. 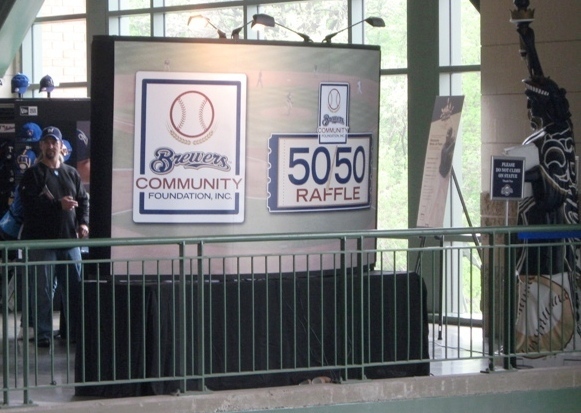 The Brewers have several ways to score tickets helping out your fellow Brew Crew fan; look for them in the “Community” section of the team website. You could win tickets by participating in any of several marathon runs or other programs. On their website, there is also a link called “Brewers Buddies Ticket Requests”. The team will donate tickets to charitable organizations, so if you’re part of one, send in a request for tickets on your charity’s letterhead. You deserve it! Those are just a few ways to score deals on Brewers tickets; there’s other ways to save some bucks at the ballpark too. Stay tuned. Miller Park has an impressive seating bowl, with four whole tiers of seating. I talk about cheaper seats elsewhere, but here’s three Miller Park seating tips for the lower levels. 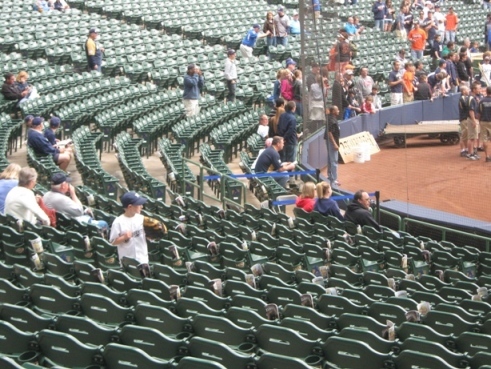 Miller Park Seating Tips, #1) Field Level. The lowest level seats at Miller have a low slope, but the view is just fine. The seats closer to the outfield are angled towards second base for less neck strain. All the seats between the bases cost the same; you have to get close to the corners to see a price drop. The first five or so rows of each Infield section is considered Diamond Box, and command a significantly higher price. So if you want one of the better seats, try a third party seller like SeatGeek. The Field Box seats, like most all seats at Miller, are surprisingly reasonable in today’s baseball climate. There are some 25-26 rows in most sections. A well-populated section of Brewers fans. Good place to be. 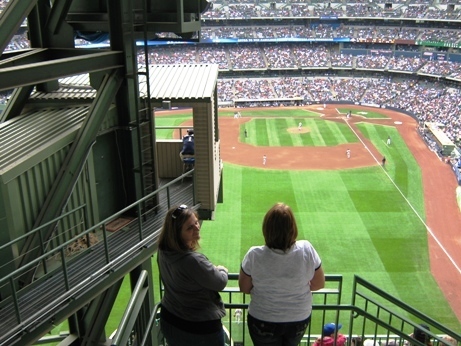 Miller Park Seating Tips, #2) Loge Level. The Loge section is the second tier, from foul pole to foul pole, and follows the same pricing pattern as Field Box; infield and outfield seats, and the lower row seats are Diamond seats. The price disparity isn’t as large here though. Loge seats can be the best value in the ballpark. In many ballparks the second tier is the suite or club level, but at Miller they’re for the common folk and are physically only slightly higher than field level. Great view for the price, especially on bargain nights. The higher rows of Loge Box seats can suffer from view problems with the overhang of the Club Level; generally about the 18th row up might give you problems seeing the scoreboard. I half expect to hear cartoon music using these. 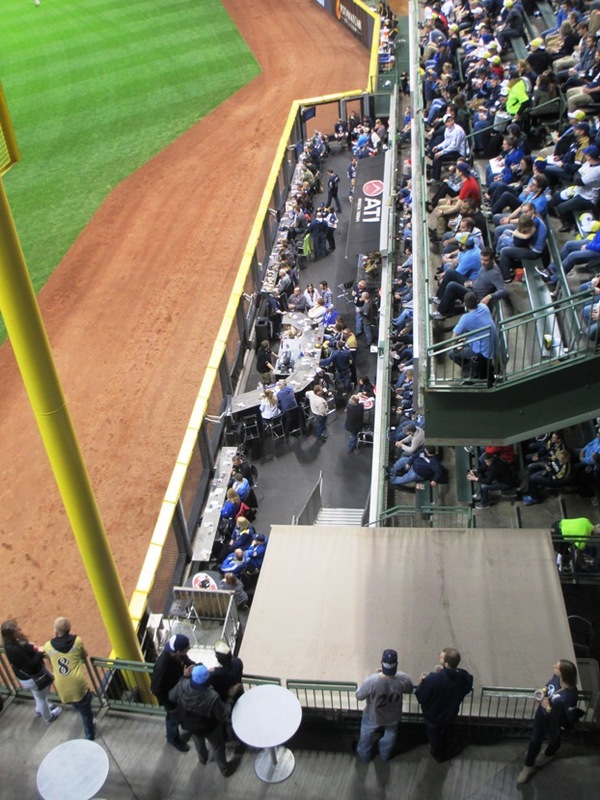 Miller Park Seating Tips, #3) Club Level. The Club Level is the third tier above the Loge Level and are fairly high up for premium seats. The seats there cost a bit more, but you have access to the climate-controlled, carpeted Club Level concourse, which is nice on a cold (or hot) day. You’ll also have access to the huge SKYY Lounge on the Club Level, overlooking Helfaer Field. There are plenty of deluxe (for a ballpark) food options—carveries and stations for pasta, burgers and stir-fry foods to choose from. In the infield seats you can request waitress service. 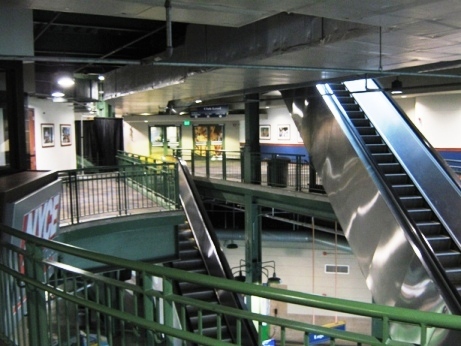 Getting to the Club Level is an adventure; you can use either the escalator that finds its way up through a maze of impressive structure, or use the clock tower elevator next to the front entrance. Should you land a Club Level ticket, it’ll be helpful to have it within easy reach, since the Brewers are big on ushers checking tickets at this level. The Club probably isn’t the best place for families; they don’t have the playgrounds that the lower concourse has, and the kids might not enjoy it as much. Better to save this one for a client or a date. 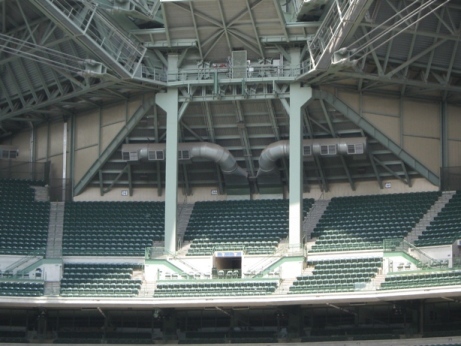 There you go; three levels of Miller Park seating for those of discriminating tastes. You can always save a few bucks with the cheap seats though…there’s plenty of them here. 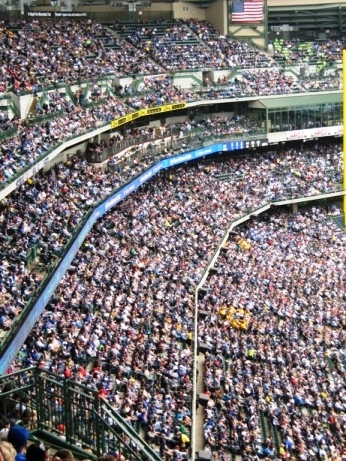 If you’re looking for cheap seats at Miller Park, you’re in luck…there are a lot of them. Miller has a good amount of even really good seats that are affordable, but here are two options you can get with just what’s in your pocket. These poles actually go all the way to the ground. Or so the tour guide said. Cheap Seats at Miller Park, Tip #1: The Uecker Seats. 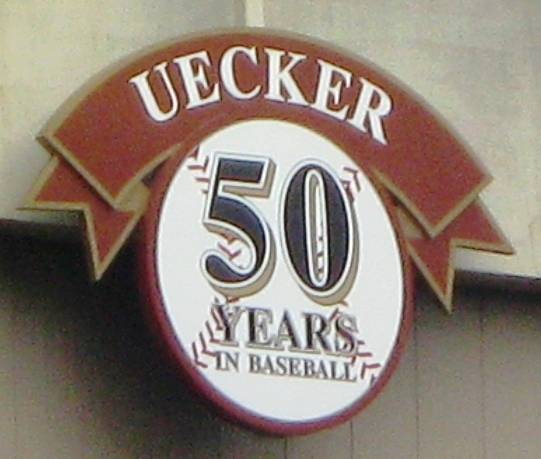 The Brewers offer their fans an opportunity to see a game for one dollar, in the humorously named “Uecker Seats”. I’m dating myself with this, but I remember the Miller Lite commercial featuring “Mr. Baseball” Bob Uecker, in which he gets ousted out of his seat (to which his reaction is “I must be in the front rooooow!”) and placed in the worst seats in the ballpark, where he screams at the umpire. It was funny, and the Brewers picked up on it when they opened Miller Park in 2001, declaring the highest seats behind home plate the “Uecker Seats”. These seats are blocked by pillars that hold up a portion of the ballpark’s massive roof, so sitting here closer to the aisles means a partially obstructed view. But the seats are just four quarters. You can’t beat that. In order to get a Uecker Seat, you have to get in line and buy them at the box office, pay cash, and enter the ballpark directly after buying the ticket. If you have a group they need to be with you. For a buck, you can see two-thirds of the field. But once you’re in, you can stand just about anywhere, and many people simply move to a better seat during the game. But if you’re not close to the aisles, the view from the Uecker Seats can be perfectly acceptable (better than in the above photo, obviously). 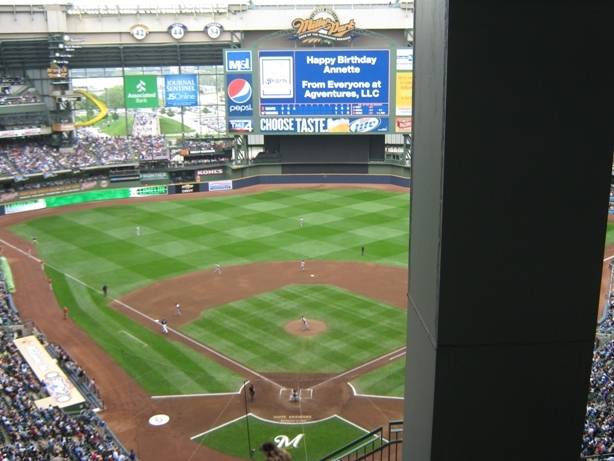 The only caveat with the Uecker seats I have is this: for a high demand game, and the Brewers have quite a few of them, you will need to get in line early. This means you might not be able to enjoy the tailgating, and the smell of the sausages cooking may get to you. Incidentally, the Brewers just added a statue of Uke sitting in the seats named for him. A great photo-op. Great view of the slide though. Cheap Seats at Miller Park, Tip #2: Bernie’s Terrace. You should actually avoid Bernie’s Terrace, unless, of course, you just want to get into the ballpark cheaply. The Bernie’s Terrace seats are so named for their proximity to the platform where mascot Bernie The Brewer sits. Bernie stands there during the game, waiting for a Brewer to knock one out of the park (or hit an inside-the-parker, as happened my last trip there). When this happens, he slides down his slide onto the lower platform. It used to be into a vat of beer, but the Brewers became concerned about their image when moving into Miller Park (?) and cleaned it up a bit. So sitting in the Bernie’s Terrace sections (441 and 442), you’d think you’d get a good close up view of Bernie sliding. Depending on where you are, you might or might not. But your real concern will be that the affable mascot’s platform creates a ridiculously obstructed view. Sitting in the upper rows of Section 442, you will lose almost half of the entire field to this. Not to mention that you will be about as far from home plate as seats get in Miller. Not a great way to watch a ballgame, so if you’re serious about seeing the game, you’ll want to avoid Bernie’s Terrace. The nice thing is that next to the Uecker Seats, they are the cheapest tickets in the ballpark, cheaper than standing room even. 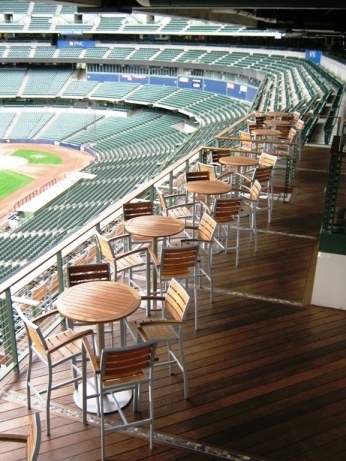 And you can order the Bernie’s Terrace seats ahead of time from the Brewers’ website or box office. Many people buy the cheap seats at Miller Park and just find a better place to sit. For lower attendance games, this is fairly easily done, so long as you don’t try to sit in a Field Level seat behind home plate. But you’ll have a much harder time doing this for a Cubs game or a weekend game. That’s just two great deals at Miller; there are a whole lot of other ways to save a few bucks. Stay tuned. I don’t know what they do on Thursday, but it’s not a fish fry. Miller Park Shuttles, #1: J&B’s Blue Ribbon. In the past I mentioned Long Wong as a decent place to go for cheap eats and a free ride to Miller Park for a Brewers game…because they had popular Bloody Marys, Chinese food, and of course, a bowling alley. Yes, a bowling alley. Fortunately J&B’s, the new owners of the establishment in the same spot, kept the bowling alley and much of the existing cafeteria feel of Long Wong’s. But I will say, it looks much nicer now. J&B’s is known for bar food: burgers, wraps, “garbage fries”, and pizza. They have a fish fry that people like and the pizza gets pretty good reviews. 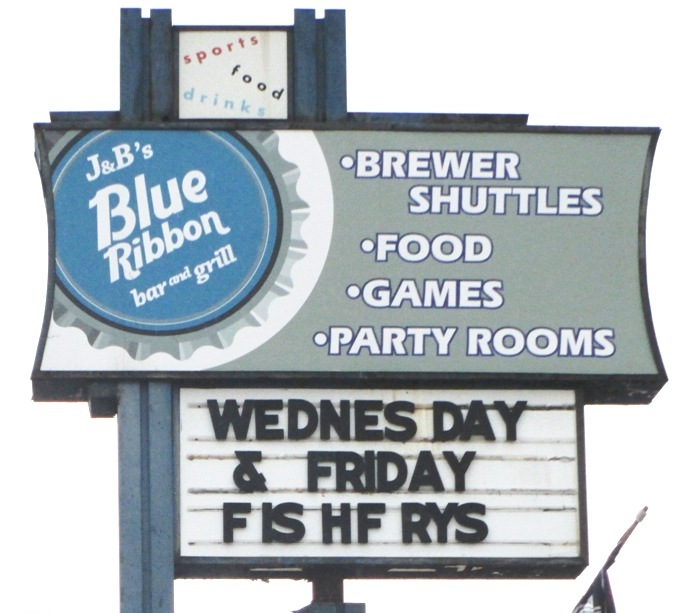 All at what is still a pretty affordable price as bar food goes, and the location is convenient for additional bar hopping on Blue Mound Road. You should be able to find a free place to park, especially if you arrive early. And of course, they’ve kept the bowling alley. It looks like a superhero vehicle, doesn’t it? 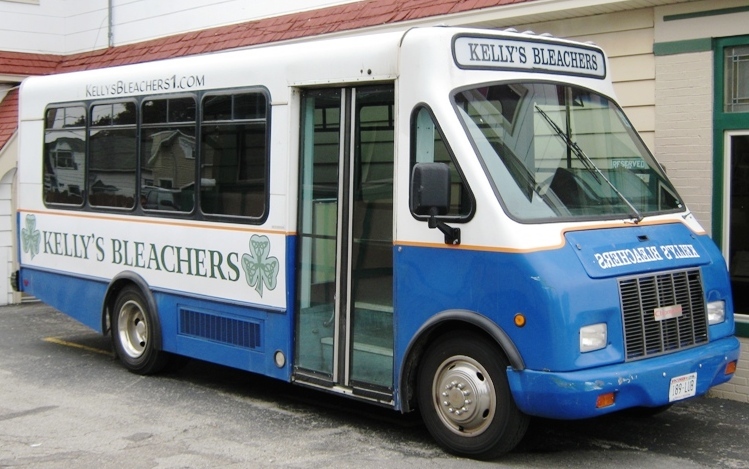 Miller Park Shuttles #2: Kelly’s Bleachers. I have to give a shoutout to Kelly’s because the owners of the place were very friendly to me during my visit and seemed to dig what I do. But I’m speaking objectively when I say that Kelly’s may be the most baseball-themed of all of the taverns that offer shuttles to Miller. They’re also located in a good spot, almost directly off of General Mitchell Boulevard. If you weren’t actually going to the game, Kelly’s would be a fine place to enjoy it anyway. There are plenty of big TVs, and the walls feature a large amount of Brewers memorabilia including the shovel that first broke the ground for Miller Park. The nicer thing about Kelly’s is that they have their own lot of about 40 spaces, and as far as I know they don’t charge their customers to park there. You can park on the street in front of the place with little trouble too, but at Kelly’s you can be fairly sure you’ll have a spot. And the food is pretty good; if you’re ravenously hungry, you can get a 4-pound burger. Yes, you read that right. What’s better than 60-cent wings? Taco Wednesday! Miller Park Shuttles #3: Rounding Third. 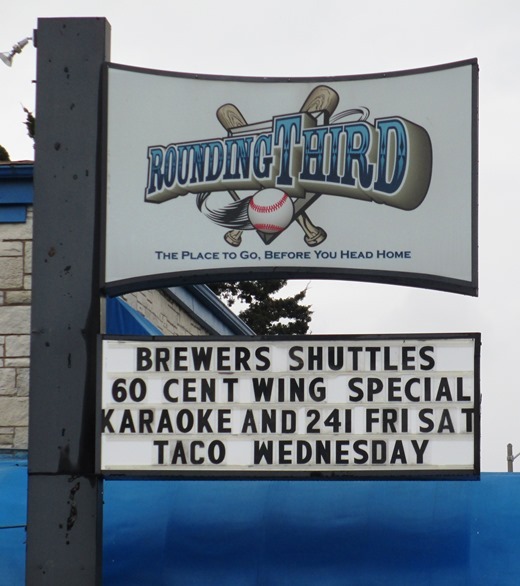 Rounding Third isn’t the fanciest place; they have a pretty nice jukebox but overall it’s more of a functional bar than anything else. 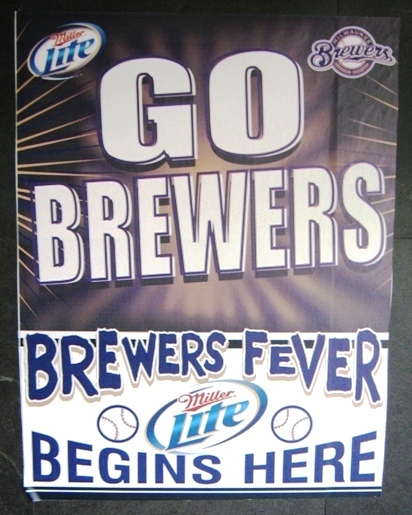 But it’s definitely hooked up for Brewers games, with team memorabilia and drink and wing specials on game days. Rounding Third has some unusual food items, including sloppy Joe nachos; I tried their jerk wings there and they were perfectly good and reasonable (and spicy). It’s not too far from the ballpark, parking is free in their small lot and on streets nearby, and it gets packed with Brew Crew fans before and after games. A good time is had by all. Those are three bars that will help you get to Miller Park just on Blue Mound Road nearby, but there are many, many more for each taste. You can park on Blue Mound and find a bunch, but they’re found elsewhere in the city too. If you somehow manage to pass through the Miller Park tailgating and still have room in your stomach, there is still an outstanding selection of Miller Park food too. Most anything you’d be interested in eating at the ballgame, and possibly a few things you’d never want to eat at a ballpark, is available here. Made by the “Bomb Squad”. 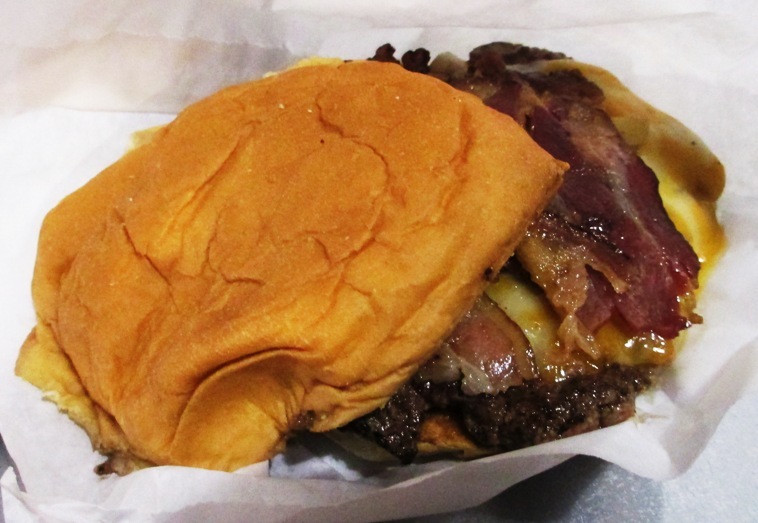 Miller Park Food, Tip #1: The AJ Bombers Burger. Any burger joint that wants to differentiate themselves from McDonald’s is going to mention that their burgers are “fresh”, and AJ Bombers, the eatery with an outpost at Miller, is no exception. You have to wait a bit for an AJ’s burger, and there’s no view of the ballgame from here, so get your fix taken care of before game time…and wash it down with a concrete. If you can catch it, go ahead and eat it! Miller Park Food, Tip #2: Sargento Cheese Curds. Because you’re in Wisconsin, right? 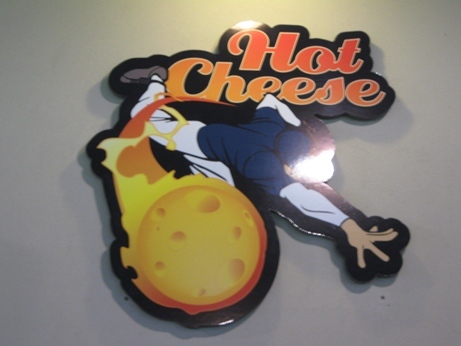 Hot Cheese stands used to be the home of some neat variations of the grilled cheese sandwich and cheese curds. Recently the Brewers reduced the confusion with just simple Sargento Cheese Curds stands, selling the fried and battered cheddar cheese nuggets in various flavors like ranch, sriracha and mesquite BBQ. If you’re not from Wisconsin, think fried cheese sticks or cheese balls but in nuggets form. A very popular thing around these parts. 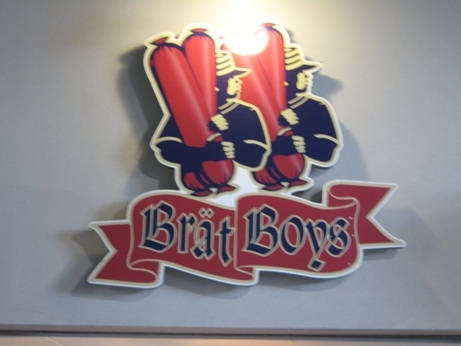 The Brat Boys wear the most expensive clothes. Miller Park Food, Tip #3: Bratchos. My apologies for not having a picture of the bratchos. I couldn’t find a basket on display, and I couldn’t order one after the AJ Bombers burger and a plate of Rounding Third wings. But the bratchos are not to be passed up on otherwise. It’s new at Miller as of 2015…and new as a food item that I’ve ever seen. Bratchos are kettle chips covered with four kinds of crumbled sausage (chorizo, Italian, Polish, and bratwurst, the staples at Brewers games), cheese sauce, sour cream, jalapenos, and sauerkraut. It’s pretty much like a mishmash of a loaded brat with chips, but I’ve never seen them combined before. As professional eaters say when eating odd foods together, it all ends up in the same place anyway. Those are three unusual and tasty stuffs on the Miller Park food menu, but there’s a lot more, like the Smoke Shack Ham Dinger, J. Agave’s tacos and the inimitable Zaffiro’s pizza. Stay tuned. 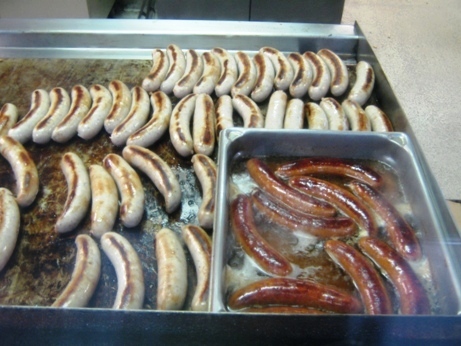 Sausages at Miller Park are available in four varieties for varying tastes. There is the Wisconsin brat, the Italian, the Polish, and the Mexican chorizo. The four flavors are very different, but according to most accounts, the one thing that makes them all taste better is the Secret Stadium Sauce. 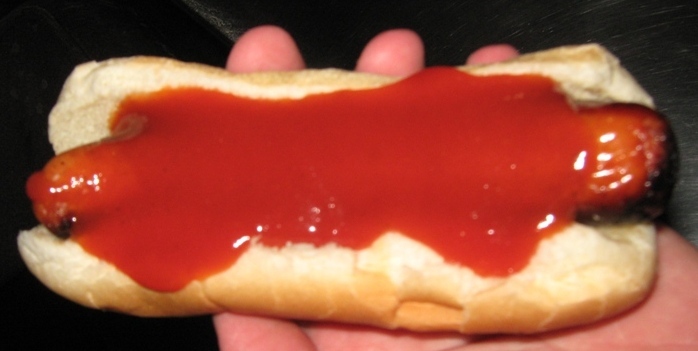 Secret Stadium Sauce is a Milwaukee institution, carried over from the days at Milwaukee County Stadium. It is a blend of water, tomato paste, corn syrup, vinegar, a blend of spices and capsicum. It’s something like a barbecue sauce, but not quite. It’s like a zingy BBQ sauce. But different. The story of its creation is one of necessity being the mother of invention: close to 40 years ago, the team’s concessions were running out of ketchup and mustard, so a vendor named Rick Abramson put together a concoction of ketchup, mustard, smoked syrup and barbecue sauce, slapped it all together, and became president of Delaware North Companies Sportservice. Now there’s a company that recognizes genius when they see it. Indeed, baseball authorities Tony Kubek and Bob Costas would trade off broadcasting duties when announcing games in Milwaukee, so they could each enjoy their brats with Secret Stadium Sauce without enduring endlessly long seconds of delay between bites. Condiments – bringing people together. There is no pre-game party in baseball like the Miller Park tailgating. It’s not even close. There’s a decent amount of grilling in the parking lot of Guaranteed Rate Field in Chicago, and things seem to be growing at Citizens Bank Park in Philadelphia a bit. But nowhere is the tailgating every bit a baseball institution as natural grass the way it is at a Brewers game. The funny thing is that the guy in the sausage costume looks like the serious one. If you’re headed to Milwaukee to see the Brewers, you should take part in it, because walking through the huge parking lots, the smell of coal and brats is going to make you ravenous. So as a public service, I’m offering five important tips for tailgaters at Miller Park. If I miss an important one, by all means contact me and let me know, but these five should at least help you avoid a tailgating fail. Miller Park Tailgating, Tip #1: Boil Your Brats Beforehand. The Miller Park lots open three hours before game time, which is a good amount of time for tailgating, but not a lot if you’re cooking raw meat on the grill that took you a few minutes to fire up. So get your Usinger’s or Johnsonville brats beforehand, and boil them in beer and water the night before—a beer for every two brats, with maybe some onion and red pepper for extra taste. It takes a while—I’ve read an hour, but I’ve cooked sausages in 20 minutes, so decide for yourself. Once you’ve boiled the brats to a gray color, all that will be needed is to brown them on the grill at the ballpark, which takes significantly less time in an environment where people will be finding bricks appetizing. In fact, prepare everything you can the night before, like slicing cheese and putting food into containers or footballs in the car. Hey, I told you Brewers fans take this seriously. Being prepared for a Brewers tailgate takes some work. Miller Park Tailgating, Tip #2: Bring Secret Stadium Sauce. OK, not everyone loves the most popular condiment in Milwaukee. It’s not even necessarily for you. You can bring sauerkraut, Kopp’s deli mustard, even ketchup, but a nearby tailgater might have forgotten the Secret Stadium Sauce, or you may come across a first-time visitor to Miller Park who wants to know what the fuss is about with the Sauce. Don’t know what the Secret Stadium Sauce is? Click here. It’s all about cheaper beer. Miller Park Tailgating, Tip #3: Arrive EARLY. I’ve already said that Brewers fans take their tailgating seriously, and that the lots open three hours before game time. Add the two together and the sum is a long line of cars in line at most of the gates, especially for the cheaper lots. These are people itching to get their tent and grill set up and will arrive an hour before the lots open to be the first ones in. Most people don’t pre-pay to get in to the lots, so attendants are making change for most of them. Bring a book to read if you must while you’re waiting, but try to get to Miller at least a half an hour before the lots open. Yes, it’s a Miller product…now. 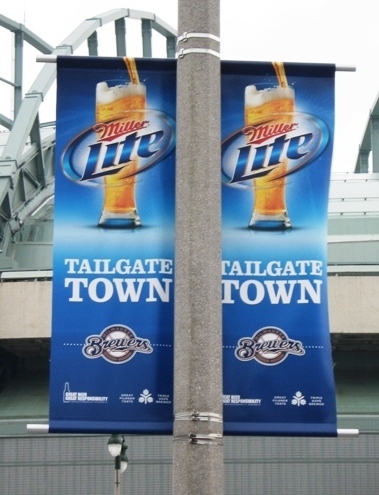 Miller Park Tailgating, Tip #4: Drink Miller Products, But Don’t Imbibe Too Much After The First Hour. Many Brewers fans insist on Miller products vs. the Budweiser Empire that has helped fund 11 World Series titles for the division rival Cardinals. I at least would recommend taking a step up to Leinenkugel’s, a Chippewa Falls brewery that is now distributed by Miller. Needless to say, have plenty of ice. But whatever your preference, make sure that you get the majority of beer consumption out of the way early. The parking lots at Miller have an ample amount of port-a-potties to accommodate tailgaters’ needs, but once that parking lot is filled with beer drinkers an hour before the game, lines will form. And waiting in line for relief after four beers can make a minute seem like an hour. We’ve all been there. Don’t be at Level Ten with three other people just as full in front of you. And this is just the preferred lot! Needless to say, it should be unique…it’s okay to have a Brewers flag, of course, but that won’t necessarily make you stand out in the Miller Park parking lot. Those are the five Miller Park tailgating tips that I consider most important, although obviously there’s other things to know…like that the Brewers will provide a taxicab ride home if you’ve had too much to drink, or that AAA of Wisconsin will give you a free tow if you can’t get your car started, or that you need to be careful leaving because people leave disposable grills everywhere. 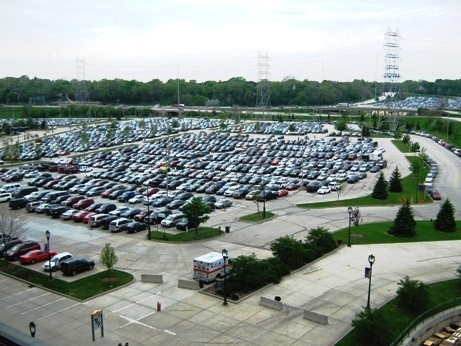 Join the party in the parking lot; in Milwaukee, a ballgame is an all-day celebration. 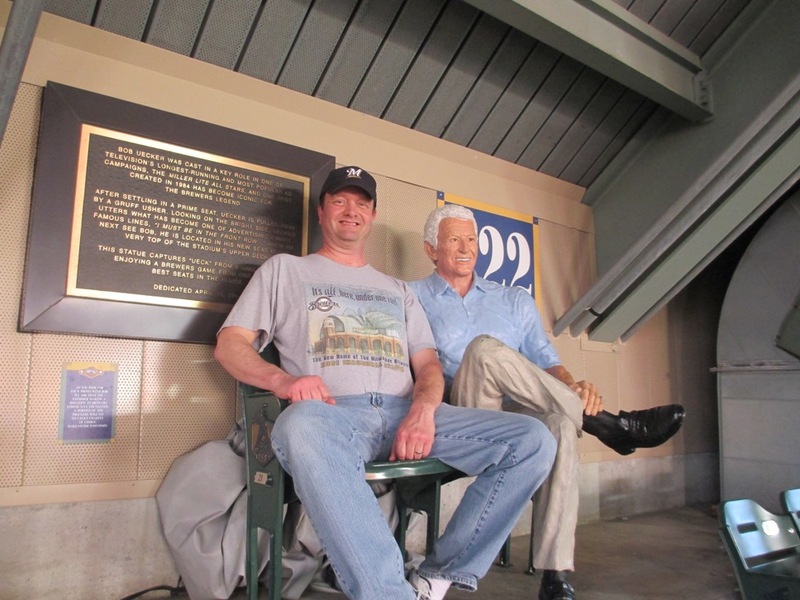 Miller Park Photo-Ops, #1) Sitting With Uecker. Recently the Brewers added a statue of a seated Bob Uecker at the very, very top of the stands behind home plate. It’s based on a Miller Lite commercial from many years ago where Uke gets ejected from the good seats, but he looks very relaxed at the top. This is a very popular photo-op here, so there will likely be someone available to take the photo for you. Victims of the crane accident of 2000. Miller Park Photo-Ops, #2: The Construction Workers Statue. During the construction of Miller Park, three construction workers lost their lives in the Big Blue crane accident, when a crane toppled and crashed in windy conditions. 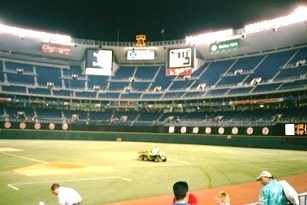 The ballpark’s opening was delayed a year as the team recovered and cleaned up the mess from the crane. 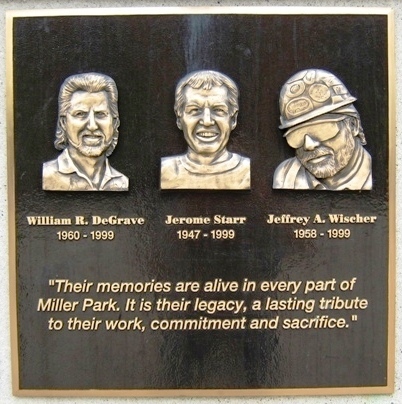 Today William R. DeGrave, Jerome Starr, and Jeffrey A. Wischer are memorialized in a statue of their likenesses, which is found near the front entrance. It is fitting that the Brewers recognized that tragic day. Check out the surprised look on Chorizo’s face when asked for his autograph. 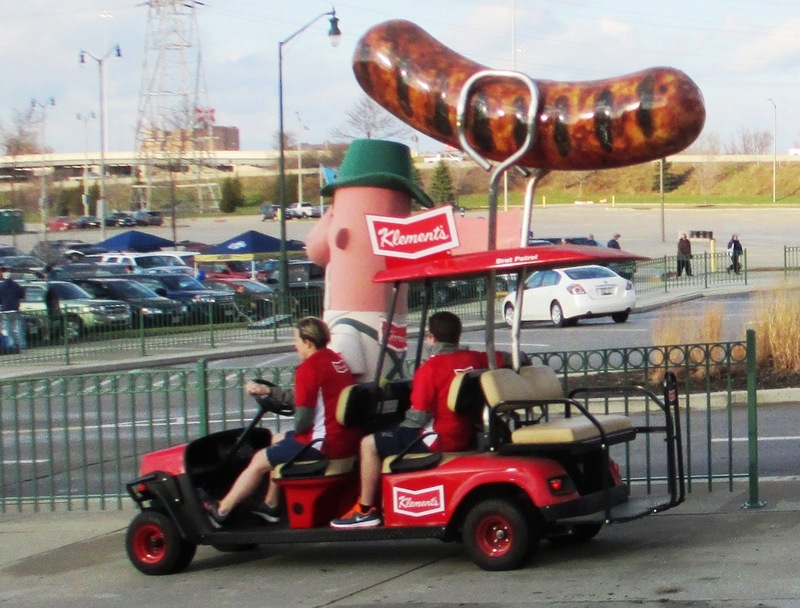 Miller Park Photo-Ops, #3: The Racing Sausages. There are a lot of noisy between-innings promotions during Brewers games, but don’t miss the Klement’s racing sausages in the middle of the sixth inning. In the race five Brewers employees dress up as the Racing Sausages mascots: a hot dog, a brat, a Polish sausage, an Italian sausage and a chorizo, and then race around the foul territory of the ballpark. 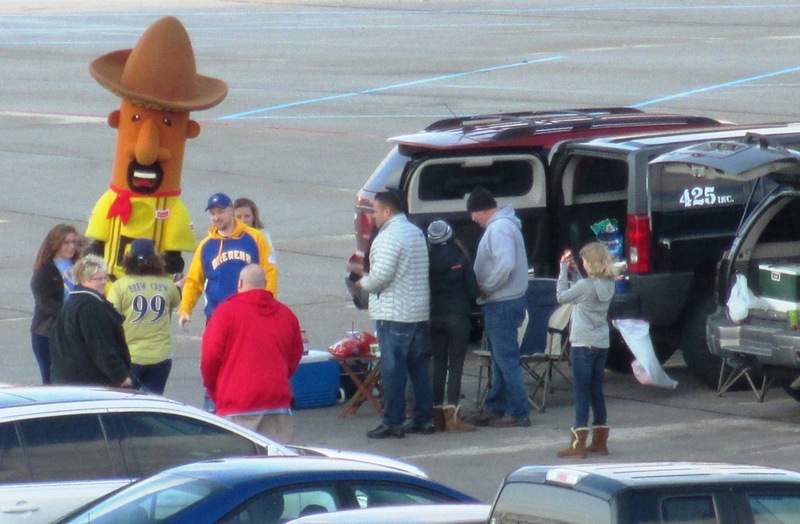 The Racing Sausages hang out in the parking lots with the tailgaters before the game, so it’s a great opportunity to pose with one. My cousin Nathan liked this photo. Miller Park Photo-Ops, #4: Autograph Alley. 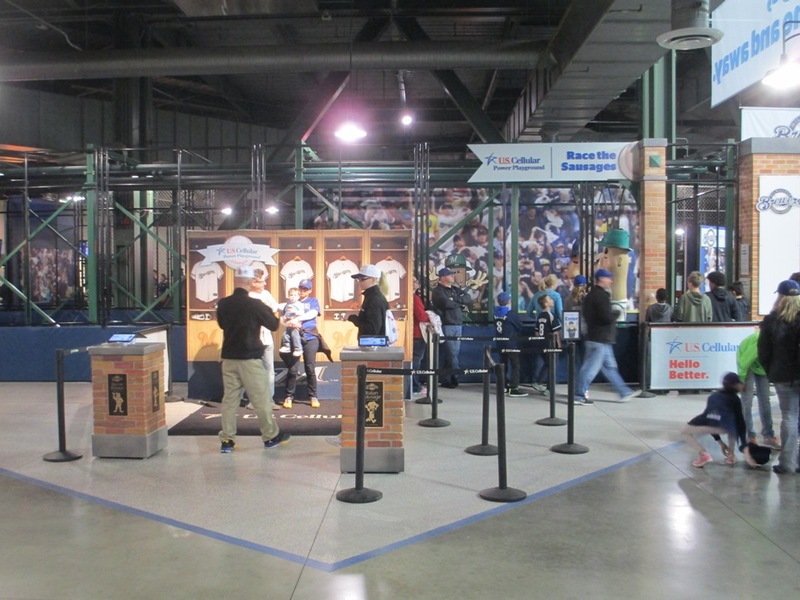 Autograph Alley is located near the Third Base Entrance, not far from TGI Friday’s. 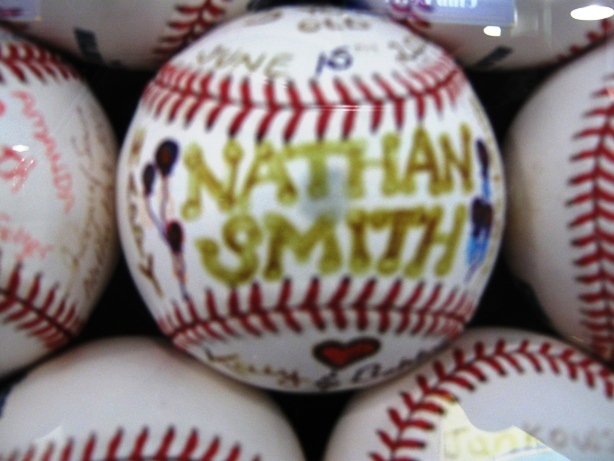 It is a wall of baseballs signed by the game’s superstars, other celebrities, and people who purchased a ball to sign. You can spend some time here looking at the signatures, some of which are amusing, or you can go to the Brewers’ website beforehand to find the location of any signed ball you may be looking for. Some big names here include Alice Cooper, Muhammad Ali, Joe DiMaggio and of course Robert Grzeszkiewicz. I left out some other things I liked—like Helfaer Field outside the ballpark, the interactive Bud Selig tribute, and the Kids Zone. Check them all out; wander around this ballpark. It’s got plenty to amuse you. Ask 30 sports travelers which city has the best baseball fans and you may get 30 different answers. Some might tell you Boston is full of fans who will be happy to pay a hefty price to see a winning team. Or that Philadelphia is full of fans who work the hardest to intimidate opponents and opposing fans. Or that the north side of Chicago has the most patient fans in the known universe. But if you want to see some evidence of a truly certifiable and dedicated fan base, check out the Arctic Tailgate in Milwaukee, a yearly event that takes place the day Brewers tickets go on sale. Yes, that means what you think it means. Fans set up tents on concrete outside of the Miller Park ticket windows. In February. In Wisconsin. To buy baseball tickets that can now be bought online in the comfort of their homes. Baseball reminds us that one day it will be warm in Wisconsin again. So there are probably 20 people in tents waiting in line, right? Read this from the Brewers website: The first 2,000 fans in line will receive a hot dog and small soda, compliments of Klement’s, Pepsi and Sportservice, as well as an Arctic Tailgate t-shirt. In 2014, the Brewers sold 91,000 tickets on the day of the Arctic Tailgate. This on a day when the temperature was six degrees. In 2015, the Brewers decided that the weather was too cold for overnight camping, even for Brewers fans. And people still got in line and bought 101,000 tickets by 3:00 PM that day. These people are surely aware that they can just shell out a few extra bucks on StubHub for Opening Day tickets. If nothing else, Brewers fans are a thrifty bunch. But to them, that isn’t the point. They just want to be the first each year to celebrate Brewers baseball. I got a fever! And the only prescription is more baseball! You don’t need to see people sitting on concrete in freezing cold to know what a dedicated fan base the Brewers have. You can witness it in any regular season game at Miller Park. After three hours of a tailgating scene unmatched in baseball, Brewers fans are as loud as any. But if you want to pronounce Milwaukee fans to be the best in baseball, the Arctic Tailgate gives you a pretty strong argument. Miller Field? Does it seem weird? 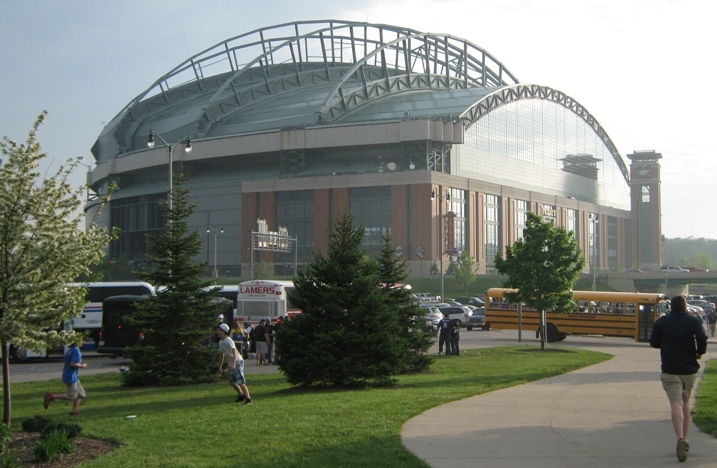 I first visited Miller Park in its inaugural season in 2001. I didn’t question that it was an impressive structure, or that there was anything less than a pleasant experience at the place. I did have some misgivings about it, though. The first was just how massive it is, and such an enormous venue didn’t seem suited for a smaller market like Milwaukee. Indoor baseball also doesn’t work as well, and even Brewers fans will often admit that Miller Park feels like an indoor facility even when the roof is open, as most retractable roof domes do. At the time I didn’t know that the windows in the outfield could be opened, and the windows more than many things give Miller an indoor feel. Since then I have researched Miller Park quite a bit, and have learned to quite love the place…baseball in Milwaukee and at Miller Park is unique and special for so many reasons. I also don’t consider it a small thing that the Brewers may be the most value-friendly team in baseball…certainly so compared to the Cubs, who are inexplicably charging as much as $65 for seats without backs these days. However, if it were up to me (and thankfully these things aren’t), I might propose that the name of the place be changed to “Miller Field”. Both “park” and “field” sound nicer than “stadium” for baseball—the word “stadium” conjures up images of the multipurpose cookie-cutters of the 1970s: Veterans Stadium, Riverfront Stadium, Three Rivers Stadium, Fulton County Stadium. When Janet Marie Smith offered her architectural consulting services to the Orioles before the building of Camden Yards, she told Orioles president Larry Lucchino: “They (meaning architectural firm HOK and the Maryland Stadium Authority) want a stadium, and you want a ballpark.” She was hired right then. And during the design and construction, the Orioles—who were smart enough to include “design concurrence” in the contract with HOK—fined any employee who called it a “stadium” five dollars. Since then new ballparks are almost all tagged with “park” or “field” in their names. But the two words are slightly different in connotation. “Park” is part of the word “ballpark” and as such it carries a connotation of an open air baseball venue with a small number of seats, like Oriole Park, PNC Park, AT&T Park or Fenway Park. The word “Field” doesn’t have that similarity, which to me (and I’m guessing to the people who named these venues) makes it more appropriate for the ginormous retractable roof domes that have been built in locations with more extremes on the thermometer, like Safeco Field or Chase Field. Welcome to the Tropicana Planetarium! You could add Tropicana Field to that list—imagine that big white air-conditioned dome being called “Tropicana Park”. Or Rogers Centre in Toronto being Rogers Park. It just wouldn’t sound right. Somehow the word “Field” seems more appropriate than “Park” for a baseball venue with a roof, whether the roof is optional or not. You could imagine a “field” protected by the elements, but it’s a bit harder to picture a “park” being surrounded with weather protection. As such Miller Park just seems a bit inappropriate as a name. As does Marlins Park in Miami, although I expect some corporation at some point will offer the Marlins an obscene amount of money to put their name on the shingle, after which the name could well be changed to include “Field”. Tropicana Field was once called the Suncoast Dome; Cinergy Field, when it existed, was once Riverfront Stadium. As I’ve said, I’ve read some reviews of Miller Park where people have somewhat bemoaned the indoor feel of the venue. OK, maybe I’m just talking out of another orifice, but somehow I think that might be a little less bothersome if the home of the Brewers was called Miller Field.